A graphic from the final report of the Mayor’s Task Force to Combat the Opioid Epidemic in Philadelphia, May 2017. Over the past 18 years the use of opioid drugs — both legal and illicit — has surged throughout the United States. Thousands of overdoses, disorders and deaths have accompanied this increase, which public health and law enforcement officials have called an epidemic. Philadelphia has been particularly hard hit, with the rate of opioid overdose deaths (48 per 100,000) in 2015 three to four times higher than those in Chicago (15) and New York (11). In 2016 alone, Philadelphia saw 907 drug overdose deaths, with roughly 725 due to opioids, according to a report issued in May by Mayor James F. Kenney’s task force on the epidemic. Designed to alleviate pain, opioids are not new, nor is the public health crisis they present unprecedented. The poppy flower, from which opium, morphine and heroin are derived, was known since ancient times for its painkilling effects. In the United States, heroin was legally used until 1924 when it was outlawed due to its highly addictive effects. Researchers worked to develop alternate opioids, such as oxycodone (under the popular brand name OxyContin), hydrocodone (Vicodin), methadone and fentanyl. But since 1999 the United States has experienced a fourfold increase in the number of deaths from both legal and illegal opioids. More than six out of 10 drug overdose deaths are due to opioids, and every day approximately 91 Americans die from an opioid overdose, according the federal Centers for Disease Control and Prevention. In 2014, the latest year available, 28,647 people died of opioid overdose. Prescription opioids are a “driving factor” in this increase, according to the CDC. In 2013 health care providers wrote almost a quarter of a billion opioid prescriptions, or one bottle for every American adult. Heroin addiction has paralleled the increase in opioid abuse. Many new users have switched from expensive prescription drugs to heroin, which has become increasingly cheaper, more powerful and more available in the community. The twin vectors of prescription opioid and heroin abuse have collided in Philadelphia with devastating results. Between 50,000 and 60,000 Philadelphians misused an opioid prescription in 2016, according to the city’s task force. The report also estimated that there are currently some 70,000 heroin users in Philadelphia. Drug hotspots such as the city’s Kensington section have made national headlines with gruesome images of open heroin use, needle-infested parks and drug-related homelessness. Throughout the Philadelphia area, much of the damage wrought by opioid addiction is incalculable — broken families, shattered dreams, ruined health, loss of work and shelter, criminal violence, fractured communities. 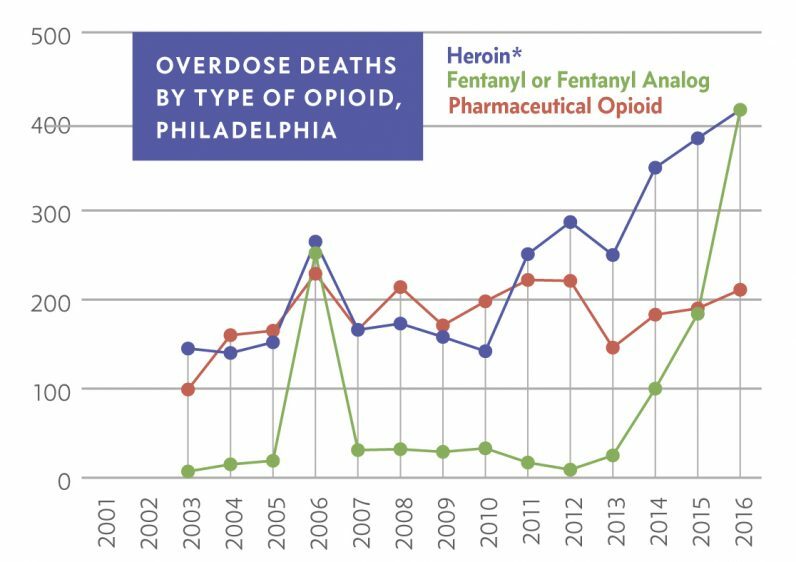 While many overdoses are happening every day in Kensington and its surrounding North Philadelphia neighborhoods, the task force’s report showed hundreds of fatal and thousands of near-fatal drug overdoses are occurring throughout the city each year. Kensington has become a magnet for drug customers from Philadelphia’s suburbs, but those communities too are grappling with the epidemic that is placing heavy burdens on the public health and criminal justice systems. But it is families who bear the most devastating consequences from the modern scourge of drug abuse. These include babies born into withdrawal, called neonatal abstinence syndrome, which “may interfere with a child’s brain development and result in later consequences for mental functioning and behavior,” according to the report. Children, youth and young adults are especially at risk, the report suggested, because the rates of substance abuse increase until peaking in one’s 20s and declining thereafter. But with today’s purer heroin and synthetic fentanyl – which is 50 to 100 times more powerful than morphine — coursing through streets and communities, no one ages out of the risk to addiction. I was at the last task force meeting. It really blew my mind that cbh talked mainly about the hidden treasures of the 12steps and said how “recovery” was there for folks, but they just didn’t know. I’d say that’s really not true. People know. Treatment as it is has been and continues to be an abysmal failure. The real heart of this issue is the Drug War. Nobody mentioned it. Interdiction and other drug war policy catastrophes coupled with a free pass for the big pharma pushers landed us square in fentanyl ville. The harder you make it to smuggle drugs across a border, the stronger and smaller those drugs become. Also the more the police intervene and make drugs harder to get, the more valuable they become. Basic free market stuff. So time to wake up and unite. Drug users need society to side with them and recognize this failed drug war and mass incarceration as genocide to kill minorities and the poor. But to first profit while they suffer. I’m sick of burying friends. I am on methadone and in a long term program for homeless mentally ill men who use substances. This is no longer our fault. The real disease is stigma and blind mass acceptance of a war on our families. Insanity.